Landmarks voted to de-calendar St. Augustine’s Church and Rectory after designating an extension the Park Slope Historic District, in which the church is located. On April 12, 2016, the Landmarks Preservation Commission cast dispositive votes on ten items for designation, nine of which were included in the commission’s backlog initiative. Eight individual landmarks were designated, as well as one historic district. Commissioners voted to remove one item, St. Augustine’s Roman Catholic Church and Rectory, from its calendar. The designation of the Park Slope Historic District Extension II will add approximately 292 building to Landmarks portfolio. The extension is composed of five sections adjacent to the northern portion of the Park Slope Historic District. The extension shares its development history with the previously designated district, and is characterized largely by 19th century masonry rowhouses, with some apartment buildings and institutional structures. At the October 2013 hearing, wide support was voiced for designation, including from elected officials including Council Members Stephen Levin and Brad Landers, Borough President Marty Markowitz, and Assembly member Joan Millman. Community organizations, residents, and preservationist groups also testified in support. Landmark voted unanimously to designate the district extension. Landmarks then voted to remove St. Augustine’s Roman Catholic Church, which had been added to Landmarks calendar as potential individual Landmark in 1966 from its calendar. The church, at 49 Sterling Place in Brooklyn, lies within the Historic District extension, which commissioners determined offered the 1888 Gothic Revival church sufficient recognition and protection. Chair Meenakshi Srinivasan called the church “a handsome anchor” in the district extension. The Italianate 65 Schofield Street House, an Italianate farmhouse located in the Bronx’s City Island, is thought to date to 1860. The Schofield’s were among the island’s most prominent families, and one of the first to acquire land on City Island. Commissioner Michael Devonshire called the building a “survivor,” and said there were few better Italianate houses in the City. Commissioners unanimously voted to designate the Pepsi Cola Sign overlooking the East River from Long Island City in Queens. Landmarks cannot regulate the content of signs, but the icon is protected through agreements made with Buildings. At the meeting on February 3, 2016, Srinivasan said designation of the sign would be an “honorific” recognizing the public’s affection for the sign. Before voting on designation, Srinivasan added that the sign’s history, reconstruction, and preservation through easements would also be memorialized by landmarking. While the commission determined that it was impracticable to designate the entire 482-acre Greenwood Cemetery as it was originally considered in 1981, due to the multitude of owners of the individual plots, and it continuing interments as an active cemetery, it did elect to designate three historic and architecturally significant buildings owned by the cemetery association. 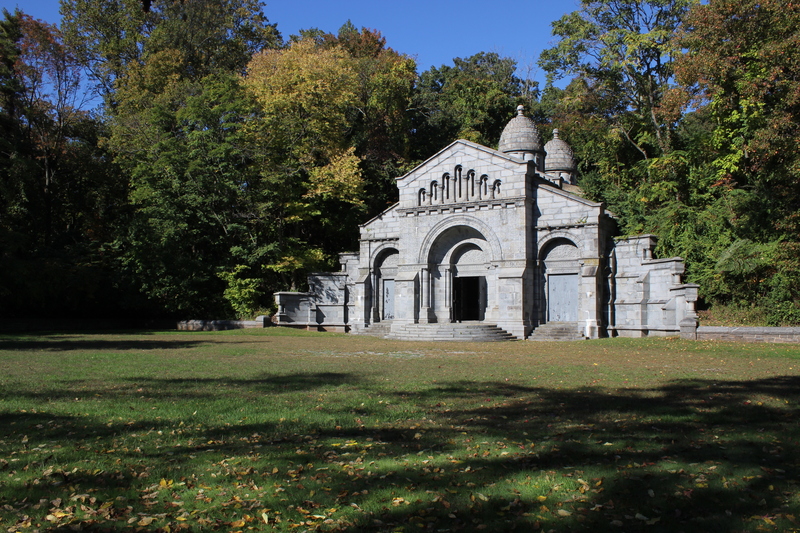 The Fort Hamilton Parkway Entrance, designed in Victorian Gothic style by architect Richard Michell Upjohn and an associated visitor center were designated, as was the 1913 Chapel, designed by the prominent firm Warren and Wetmore. Commissioner Fred Bland noted that the landscaping of the cemetery had provided inspiration to Frederick Law Olmstead, and commended the cemetery for their maintenance of the buildings. Commissioner Michael Goldblum asked Landmarks staff to look into ways to ensure that the buildings would perpetually be able to be perceived in the rounds, as only the structures’ footprints were designated. At 227 West 99th Street in Manhattan, Landmarks voted to designate the St. Michael’s Episcopal Church campus, comprising the church, parish house, and rectory. At the hearing, Church representatives had asked that the parish house and rectory be excused from the landmarked site. Commissioner Diana Chapin praised the integration of the later ancillary buildings into Romanesque Revival complex, while Commissioner Goldblum remarked on the spatial implications of the ensemble. At the meeting, commissioners also designated the 1817 rowhouse at 57 Sullivan Street in SoHo, Manhattan, and the Lydia Ann Bell and J. William Ahles House at 39-26 213th Street in Queens. Commissioner Michael Devonshire noted that 57 Sullivan Street retained rare Newark sandstone in good condition. Commissioner Chapin said the Ahles house, which was built in 1873 and renovated in 1924 was significant in the history and development of the Bayside neighborhood. The owner of the Lady Moody-Van Sicklen House, a Dutch Colonial farmhouse constructed in the early 1700s opposed designation, and argued that an expansion and alterations in the 18th century compromised its significance. Landmarks Research Department nevertheless recommended its prioritization for designation as it retained its original form and massing, and many architectural elements. Commissioner Devonshire called the owner’s opposition “unfortunate,” and said the unique building was a “palimpsest” of architectural and social information, and that it was Landmarks’ responsibility to ensure it was preserved for future generations. Chair Srinivasan thanked the commission’s staff for all their work in the efforts to address the backlog. She reiterated her commitment to disposing of the backlogged items on the commission’s calendar in 2016. The chair scheduled the next batch of items for a vote on designation for June 28. LPC: Park Slope Historic District Extension II, Brooklyn; St. Augustine’s Roman Catholic Church and Rectory, 49 Sterling Place, Brooklyn; 65 Schofield Street Houses, 65 Schofield Street, Bronx; Greenwood Cemetery, Brooklyn; Lady Moody-Van Sicklen House, 27 Gravesend Neck Road, Brooklyn; Vanderbilt Mausoleum and Cemetery, Staten Island; Pepsi Cola Sign, 4600 Fifth Street, Queens; J. William Ahles House, 39-26 213th Street, Queens; 57 Sullivan Street House, 57 Sullivan Street, Manhattan; St. Michael’s Episcopal Church, 227 W. 99th Street, Manhattan (LP-2558; LP-0150; LP-2395; LP-1233; LP-1130; LP-1208; LP-1653; LP-2341; LP-2344; LP-2281) (April 12, 2016).